This is the year that growing lettuce got pretty enough to share on patio tables. With all these fresh greens being grown in some very convenient places It’s a great time to whip up some home made dressings. I first saw these adorable lettuce, kale and herb container varieties featured in today’s post out at Veggie Trials last summer and was SHOCKED to see them in OHIO this year. It usually takes a few years for the cool trendy stuff to reach Ohio markets and shopping centers. I shared the first basket I saw at a local garden center right away on Facebook. I hope you will check out my images from my back kitchen garden patio where I’m currently growing lettuces, herbs and flowers that I used in today’s recipe share. After making the blue cheese dressing recipe I decided to enjoy it out on the back kitchen patio garden where I had harvested the salad. 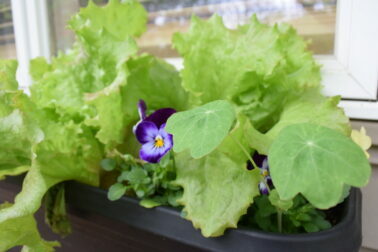 It is super easy to grow lettuce in containers as you can see from these photos. 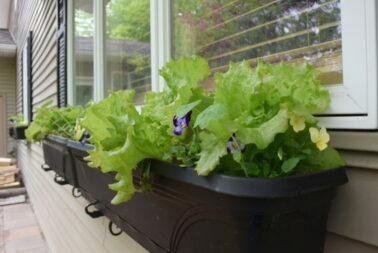 Window boxes in the kitchen patio garden. Lunch Salad … new dressing to try out on the kitchen patio garden. If you have a hard time finding these varieties be sure to contact me or comment on this blog so I can help you find them. Put the cheese in the salad bowl, and mash with a fork. Add the vinegar and continue to mix. Add the buttermilk or yogurt. Taste, and add a bit of oil if needed. The dressing should be creamy and not overly thick. Season with pepper and if needed, some salt (some blue cheeses are very salty). Place the washed greens and other ingredients on top of the dressing. When you’re ready to eat, toss the salad with the dressing. Garnish with more bits of cheese, or not, as you wish. I shared a quick live stream at lunch today and also took this video with my Nikon 1 J4. I hope you will take a look and don’t be shy… ask me questions about the veggies and flowers I’m growing in this video. [alert-announce]Do you have a favorite place to grow lettuce? I’d love to hear about it and of course share ideas for recipes to use the harvest in.